I’ve spent a solid four weeks working on the interior firewall, under dash and kick panel areas. My firewall mat was rather decrepit, my kick panel areas uncovered and unattractive with dirt, rust and old adhesive and I had a lot of surface rust high up under the dash. I stripped everything down, cleaned everything up and finished with rattle can Eastwood Rust Encapsulator. The firewall mat was the biggest, most time consuming problem. In the driver and passenger areas, the old firewall mat consisted of what appeared to be ½ inch coconut fiber batting covered with a perhaps 3/8” thick hard pressboard. Each side was sewn to a piece of linoleum that wrapped around the middle console. Once I started to remove the mat, it pretty much disintegrated. I scouted around and was unable to find replacement materials, although I do believe I could have gotten the batting. I took a chance and bought the firewall mat, part 691585S, that is for the PV544 and P210 Duett. I spent a few days trying to install this but not much matched up to my PV444 firewall and I gave up. I picked up a piece of what I suppose is called a carpet runner from the local building supply (Home Depot). It was actually a pretty nice piece of Neoprene type material, no pattern, perhaps 3/8” thick, no static. 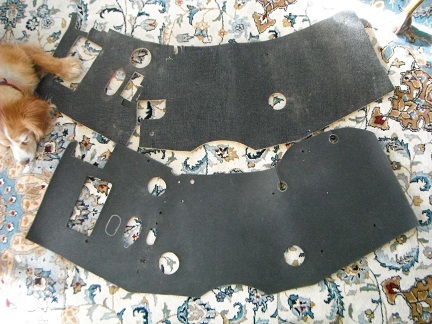 I used the firewall mat for the PV544 to cut the basic shape. Then with many, many, many test fittings, I located and cut all of the openings, including the holes for the retainer plugs that hold it up on the firewall. The driver’s side was a particularly difficult as was cutting the holes for the “heat duct” through the center console to the passenger side. I didn’t have that heat duct, per se, but I made one up out of aluminum and slid it through the console area. Comparison of the two mats. PV544 firewall mat on top (slightly mutilated by me). PV444 firewall mat made by me on bottom. On the driver’s side, I applied 1/8” Hushmat on the firewall and then 1/8” Hushmat on the backside of the firewall mat. On the passenger side, I applied 1/8” Hushmat to the firewall and then ½” Hushmat to the back side of the firewall mat. I really wanted to apply more soundproofing on the drivers side, but would have had a major fitting problem if I did so. I also applied the 1/8” Hushmat to the back of my mat at the center console. I replace the heating ductwork (newly re-painted) (my heater control valve tested out), cut off or ground down any sharp points in the engine bay from the penetrating screws, reinstalled the coil. 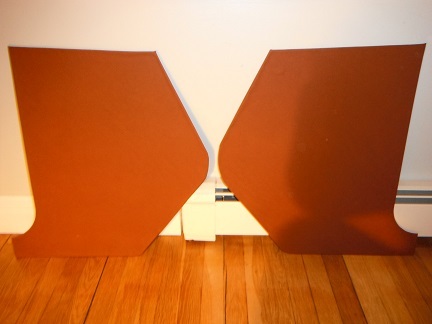 I plan to install kick panels. The pieces are nothing more than pressed cardboard, plasticized on the inside surface. After test fitting, I needed to trim the forward edges a bit. I then cut and applied a vinyl fabric. They came out pretty nicely. I plan to screw them on. Last edited by blueosprey90; Jan 14th, 2019 at 03:05. Removed the parking brake cable on driver’s side. Repaired (?) the fitting at the brake drum. The brake cable’s protective sheathing appears made of plastic, while the fitting is crimpable metal, perhaps lead. I used epoxy on the joint interface, then reinforced on the exterior with a “cast” made from angel hair fiberglass. Nice job on the mat and kick panels. I never know how this might work, but I thought I might post a video question concerning my parking brake. Last edited by blueosprey90; Mar 14th, 2019 at 01:53. I can't remember how wobbly the actuating parts on my hand brake assembly were before I took them to bits but on the whole those bits aren't ever precision engineered - they are gonna be wobbly even when new. In the video you mention that the outer cable is bust - this is more likely to be causing trouble before you get to the play in the wobbly parts around the brake shoes. A Bowden cable system relies on rigidity of the conduit - if that ain't there then the cable will not pull properly. Army, you probably have a better book than I have. Mine is so old that the pages are brown and crumble. I'm not sure if it takes more ingenuity to open the book than to repair the part. I searched quite hard to find a proper replacement brake cable, but the part # for a '57 seems to be unique. And not available. So I'm not sure I should go up to a 544 brake cable or down to an older model PV444. I pulled some measurements off the old cable and will take a photo. I was unable to weld the sheath back to the end fitting because the sheath was made of some sort of plastic. I was able to get the end fitting to slide back over the sheathing, but the overlap was maybe 3/8" at most. I used an epoxy glue on the interface. Then I made an exterior "cast" out of fiberglass overlaying the 3/8" joint and extending an inch or so down the sheath. It seems strong enough just looking at it, but I suppose a high risk of failure on first use. For now, I think I'm going to try to get the brake cable hooked up and see if it works. I've just found these, and they have a clip that yours doesn't, which takes up the play in the horizontal bar. Also, do you have the correct clip on the back of the shoes, as there is no play at all in these. Is the new part too expensive? ...crappy job really - 2/10 for effort but will "get you home" for a few months!